Breakfast is supposed to be the most important meal of the day, but in this case it turned out to be one of the booziest breakfasts I’ve been to in a while. I’ve been to the Guildhall Hawksmoor before with The Euro Hedgie, but this time around the Hedgie was recovering from running the London Marathon the day before and he was in a celebratory mood. The Hedgie started off with our old favourite, the cornflake milkshake which somehow manages to distill the taste of a bowl of cornflakes, especially that flavoursome puddle at the bottom of the bowl, into a milkshake. 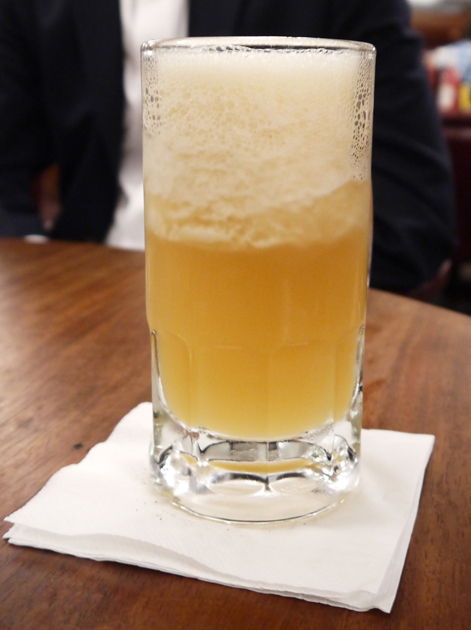 Except this time he opted for the alcoholic variant, the cornflake hardshake, which is laced with bourbon. The Hedgie could only come up with two words to describe it – ‘yummy’ and ‘yummier’. As if that wasn’t a hard enough start to the day, the Hedgie followed that up with a Shaky Pete – a mixture of gin, lemon juice, ginger syrup and London Pride. It’s not quite as tasty as it sounds, but it is at least refreshing. Apparently. 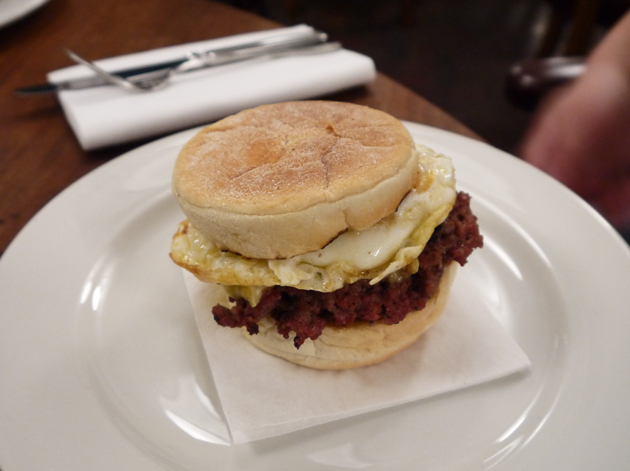 The Hedgie laced his stomach with the sausage and egg HKMuffin which is Hawksmoor’s take on the McDonald’s sausage and egg McMuffin. Unlike that proletarian breakfast, the HKMuffin uses a fluffy and yeasty English muffin that isn’t sickly sweet. It proved to be the perfect vessel for the contents without falling apart or dripping. The fried egg added a rich touch to the thick, herby, meaty sausage patty. Satisfying. The Hedgie still wasn’t finished and proceeded to graze on a plum custard doughnut. Since this is an English doughnut rather than one of those new fangled American ones, it was quite bready and dense but not too sweet. The Hedgie wasn’t impressed with the plum custard filling though. Not only was there not quite enough of it, there was far more custard than plum jam, but at least the custard was very creamy. 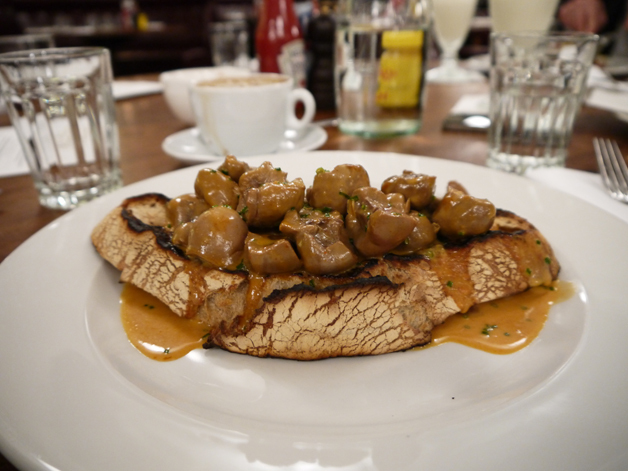 I was surprised by the size of my own dish of devilled veal kidneys on toast. The firm, suitably offaly kidneys were glazed with a very mildly spicy sauce reminiscent of mustard and curry that was also quite tart. The chewy sourdough toast was well chosen – its own tartness was a good match for the sauce, while its softness provided a nice contrast to the firm kidneys. I washed it all down with a flat white. 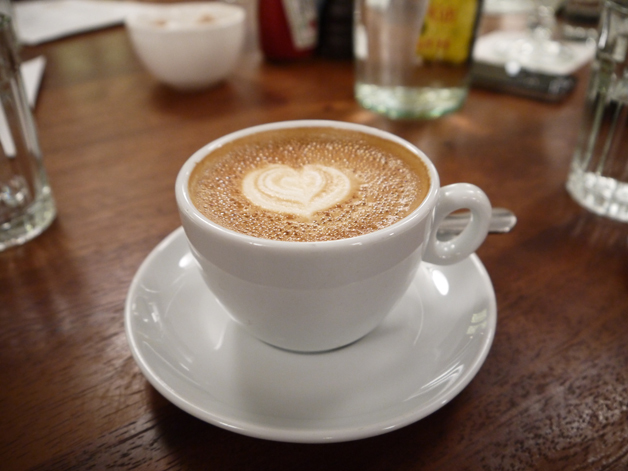 It’s still not a match for the best flat white coffees available elsewhere in London – the head isn’t very silky and it doesn’t have much character apart from a gentle maltiness, but I’m still awake despite a very early rise so it must be doing something right. We weren’t impressed with our first foray into Hawksmoor Guildhall’s pastry selection, but its staple meat dishes are still filling, tasty and just different enough to justify its relatively high cost without being too quirky and off putting for the more bleary headed and fragile breakfaster. Mildly full. I feel a bit like Brian Blessed – rounded but still agile enough to lead an aerial assault of hawkmen. Opening Hours: Breakfast Monday-Friday 07.00-10.00, Lunch Monday-Friday noon-15.00 and Dinner Monday-Friday 18.00-22.30. Closed weekends. Total cost for one person including service charge: £15-20 approx (you’ll pay closer to £20 if you’re as much of a boozer as the Euro Hedgie). 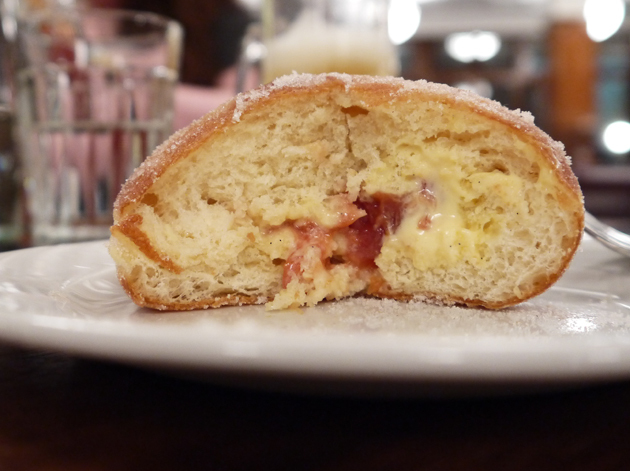 Tags: alcoholic, custard, doughnut, egg, hardshake, hawksmoor, hawksmoor day, hawksmoorathon, kidneys, london, milkshake, muffin, plums, restaurant, review, sausage, toast, veal. Bookmark the permalink. Previous post ← Moments review – the best meal of my life. And it wasn’t in London. This is so awesome! Can’t wait for your next one.